I am a Balinese, raised in a family of artists: my father is a dancer and musician and my mother is a dancer and a vocal teacher. 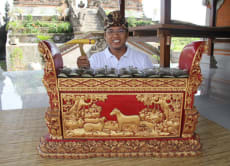 Since birth I am surrounded with Balinese culture. What's unique about me is that I have lived in the USA for 4 years which makes me open minded and adaptable with any situation.